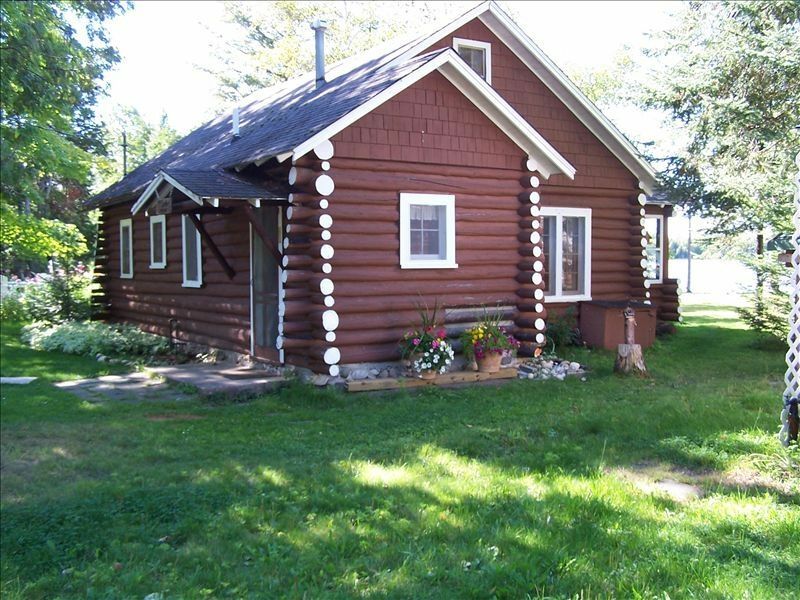 Lakefront Log Cabin auf Pickerel Lake. Ein-Zimmer-Kabine (Doppelbett) mit einem Schlafboden im Obergeschoss, (3 Betten). Authenic Blockhaus wurde ausgiebig renoviert und aktualisiert. Der gesamte Innenraum ist log und knorrigen Kiefern mit schönen Feldsteinen Kamin. Voll ausgestattete Küche und Badezimmer wurden kürzlich aktualisiert. Das kristallklare Wasser des Sees mit Sandboden vor unserer Hütte ist flach, mit harten gepackten Sand unten mit einer leichten Steigung (No-Drop-off). Perfekt zum Schwimmen und Waten. Beach, Picknick-Tisch, Lagerfeuer Grube, und achtzig Fuß-Dock enthalten. Bootsverleih von örtlichen Yachthäfen, auf der Wasserstraße, oder bringen Sie Ihr eigenes Boot und Markteinführung von der in der Nähe von öffentlichen Start. Ausgezeichnete Schwimmen, Angeln (Bass, Zander, Hecht), und Bootfahren auf 1100 Hektar großen See Pickerel. Als Teil des berühmten Binnenwasserstraßen, die Crooked Lake, Burt Lake und Mullet See verbindet. Der Innenstadt von Petoskey und nur wenige Minuten Das Hotel liegt nur ein paar Meilen östlich entfernt von all den anderen vielfältigen Aktivitäten in dieser schönen Gegend im Nordwesten Michigan. Der Petoskey / Harbor Springs Gebiet umfasst Meilen von Rad-und Wanderwege rollerblade, außergewöhnliche Golf, und einige der schönsten Strände Staaten. Our family had a wonderful, relaxing week while staying at this cabin. It was clean, and very much as it was seen in the photos shown. The yard was well kept, and it was an added benefit to be able to bring our dog. Pickerel Lake was great for boating, fishing, swimming. The water was clean and clear. The cabin was also very close to many enjoyable activities. Cabin was exactly as described,very clean and comfy. Loved the fireplace on rainy day. We felt like we were Up North! We love rustic cabins and enjoyed the upgrades. Hope to come back again. My fiance and I stayed at this cabin for a long weekend. As soon as we walked in the cabin it felt like home. The cabin is even more beautiful in person! The stone fireplace is stunning. The half-log steps leading up to the loft were beautifully constructed. The decor had the "up north" look and was very comfortable. We spent some time in Petosky for lunch, wine tastings and beer tastings. However, most of our time was spent at the cabin. Every night we sat for hours in the adirondack chairs just looking out at the lake and enjoyed gorgeous sunsets. We both were very relaxed after our long weekend away. Neither of us wanted to leave the cabin, we could have stayed much longer. We would highly recommend this rental. The owners were a pleasure to work with. This year will be our fifth year staying at this cabin. My husband spent his summers on Pickerel Lake and since we live near Pittsburgh, he wanted to take our kids back there to experience it. We found this cabin and have been nothing but pleased with it! We spend every morning drinking our coffee on the dock and then we spend every evening around the fire. My husband and son regularly catch enough fish for our annual "last night fish fry". The cabin is very clean and very well maintained with enough space for my husband, two teenage children, my mother-in-law and myself. My son loves the proximity to the store and my daughter loves spending the day in a raft reading. We couldn't be happier with our choice and know you'll love it too! This family returns every summer and loves the cabin and the lake. I am sure your family will too! !